I invite all members to share here, in the end this is going to be good for all of us. The idea is put all Portables we use in a directory on the root of our USB/CD/DVD (or another one), keeping the PE as smaller as possible in order to boot faster even from USB 2.0 or CD/DVD and once we boot the PE, run the tools we need, as an example of use this way it's very easy to keep our antivirus updated without the need of building a new PE. It is necesary to remember a PE is not a Miny OS for chat on Facebook or watch TV on line, it's pourpose is very clear: A tool for installing OS and repair failures on PC's. programs if there is an alternative already executable from PE that perhaps they are not aware of, then allowing them to concentrate in other tasks. This post is getting long, I'll start listing my favorite tools in next Post (in no particular order just as they come to my mind, latter I'll fix it). EDIT 2: See http://reboot.pro/to...e-2#entry207501for some SFX Compressed Portables I made. It is preferable to run portables from a writable media as some of them require write access to store settings. WinPE version(s): As it is not very intuitive you can put Source OS used for building the PE (including SP please). Edited by alacran, 08 August 2018 - 03:31 AM. Thread here: Very old and not updated. Description: Good alternative to Microsoft's WIMGAPI, ImageX, and DISM. Excellent for OS back-up images. Tested from WinPE/source version(s): 7 SP-1 up to 10 (I read in posts here it runs on XP SP-1 too). Description: GUI for wimlib-imagex Excellent for OS back-up images. Special Requirements: In first run downloads additional files from MS.
A fantastic idea and nice addition to the forum. A useful addition would be to request that any dependencies be listed - whether these be file or registry dependencies. Strictly speaking, a portable app shouldn't need registry dependencies - however in a PE this isn't a problem as, assuming PE is running in RAM, they will not persist following a reboot. The Disk Management script from MistyPE is a good example - run a batch to add registry settings and away you go. The Disk Management script will only work if the file versions and bit type match the WinPE version you are attempting to run it on. Some portable apps may require write access to store settings and might not run from a CD/DVD - perhaps state if tested on non-writable media. It would also be useful to list which WinPE environments they have been tested in (e.g. WinPE 3.1) and possibly under which project. Thanks, your suggestions are wellcome, I'll include them in First Post. 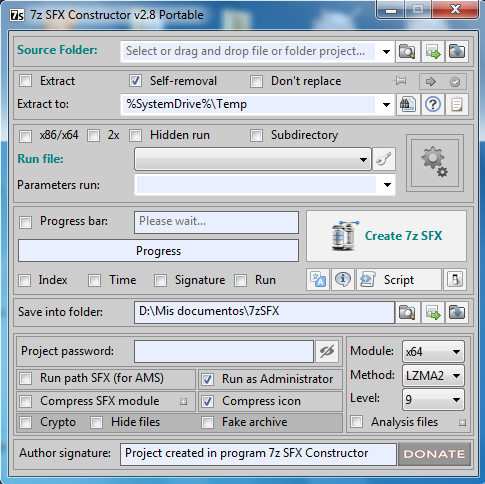 This post is about 7zSFX Constructor a FREE aplication that can be installed as a usuall program in our OS or as portable, very good for make your own compacted Portables. I suggest to create a folder in your desktop you may call it Project or any name you want, then just put inside it, the App you want to compress into a folder with the App name lets say MyApp, then select or drag and drop folder Project to "Select Folder", for x86 see picture 2- x86.png. For x64 is same procedure, only change is "Module" needs to be x64, see picture 3- x86.png. Left click on "Create 7 z SFX" and let process finish. When you close it, C:\Temp\MyApp or X:\Temp\MyApp and all it's content will be deleted. 1- Compress x86 first and latter compress x64, in order to get a SFX for each architecture (32 and 64 bits). 2- Compress x86 and x64 at the same time on separate folders preferable (but not mandatory), each one with App name as MyAppx86 and MyAppx64 put this two folders inside your Project folder, use picture 4- x86&x64.png as a guide Just make sure 7zSFX Constructor selected for you the right one x86.exe and also for x64.exe, if not manually fix it, run Create 7z SFX This is going to build a single compressed MyAppx86.exe, (Rename it just deleting x86) this new file MyApp.exe is capable to self-extract and run the respective x86.exe or x64.exe according to the OS or WinPE from it was launched, for a WinPEx64 but require sysWoW64 integrated when builded. (This is because we used x86 module when we created the SFX). Very frecuently programs have dependencies (as *.dll, .Net Framework, etc) to run properly, and if they are not available then we see a message telling us that, and the program closes. when in real OS almost all this requierements are in Windows\System32 and (if we are on 64 bits OS) Windows\SysWOW64, if there is a lack, usually program itselft installs or ofer us to download whats required, it is very easy also to install manually what we need, e.g. : DirectX9.c (for many legacy games), .NET Framework (AutoCAD can't rut without it), etc. By adding these files to \Programs\dd\ the program runs. Whilst it is possible to add these files directly to \Windows\System32\ this makes it difficult to accurately trace dependencies for other applications. Programs created using this method are far more portable and will run in other WinPE builds with missing dependencies. When a program is installed on our PC it usually also makes changes in the registry we need to add to our WinPE if we want a particular program to run from PE, it is possible to also add this registry changes in our Portable folder, before make the SFX, trough a batch file or a reg file wich needs to run before launch the program. If option 9] Programs in boot.wim is set as NO then any program registry dependencies/settings should be executed at runtime. This is acheived by running the required settings from a batch file and using either reg.exe add commands, or importing from a .reg file (or a combination of the two). Don't wanna be negative, but why would you include anything in PE image? CD's, DVD's, BD's are history. They will not come back and it makes much more sense to include clean PE with winpeshl.ini or startnet.cmd to map back to boot drive or network share. Even with such media in use it makes no sense to put apps inside PE. Usage with PE, linux based bootables with 5 bootloader ring built-in namely: G4D, Syslinux, Grub 2 (EFI), MS-DOS 6.22, Windows bootmgr / bcd BIOS/EFI modified which will then make absolutely anything in this planet to run from same media. CD's, DVD's, BD's do have inherent or lasting value. That medium is still used. Where as online content might not. That is, if a digital company goes belly up you might loose the content you paid for. Usb are very handy but are easy to loose or forget. Just like people keep saying PC's and PC Games are dead. As long as people have a need for the medium it is hard to call it history, yet. People still buy CD's / DVDs / Blu-Ray, books, and magazines. Physical media and online digital media continue to co-exist. Including programs in the PE image can make life a lot easier in most cases. Knowing that the drive will be mounted as X and not having to worry about finding the media containing programs reduces complexity. Flat boot from a UFD is a great alternative to .wim files on low RAM systems and anything on the same UFD (assuming it contains only one partition) can be easily found as the X: mount point will be used for the single volume on the disk. CD's are great on old systems that do not support booting from USB. What I meant was that when you have a choice to either add programs / software inside PE image or include the software to what ever media you are using (even CD/DVD/BD/etc) it would be way smarter to have easy update directories as I use in my projects. Example #2: is basic CMD which loops thru every possible drive letter. I think you didn't reed first post, I never said include portables in PE image, that way will take a long time to boot, In fact I said the exact opposite, as you can see in next quote. Anyway your comments are wellcome and will be good if you share any portable you use. EDIT: I was repeating two apps from second post, fixed now. yeah, figured I did misreading something or it was really weird idea to integrate something directly to PE, heh, for my defense it was 01am when I wrote that. Beside those working from PE (dotnet and WMI generator of course needing packages). Nirsoft has quite nice set of tools of course Sysinternals toys. I think they are well known and was trying to bring other apps not available there. Another use for CD's/DVD's (NON rewritables) is when you are dealing with a friend's PC (perhaps infected with virus), and you don't want to risk your USB drives. I have two DVD's with several ISO's inside, bootables through grub4dos and isolinux made with MkisofsGui 0.1 from Erwan.L, before this tool was made I had to type a long command line to run Mkisofts, very prone to mistakes. thanks for this collection off useful tools. Description: Display the usage of your hard disk / drive / directory. My absolute must-have Tool is TotalCommander. Maybe not real Freeware, but it will work also without an licence. which also should run fine in any PE. That's one weird damn softwate, lol. I mean what exactly is the purpose of the software sure escapes me. It's damn cool looking, but kinda seems like "Just because I can..."-heh. Well, at the time sequoiaview was developed it made a lot of sense, basically when you had some "tight space" on disk it provided a quick, visual way to understand what files actually filled up the filesystem (and thus allow you to delete, move or reduce them). The Windirstat (which has of course a lot of bells and whistles and as such is a tad bit on the slow side when scanning ) adds the colours by file type, which may be useful as an example to understand which stupid .dll (of which only one or two - BTW lousy - function is used) makes an otherwise "slim", portable tool a stupid mass of bloat. The "scanner" Retokener posted a link to, as well as a number of other similar programs offer what I believe to be a less intuitive visual representation of disk space, while the "proportional area" squares or rectangles are easier to the eye (besides beautiful).